Buy an EV Before the End of the Year and Save up to $13,500 on Your 2015 Taxes! In addition to cutting-edge technology and performance, state and federal tax credits are helping to make buying an electric vehicle (EV) an even smarter choice. Alongside a federal tax credit of $7,500, Colorado residents are able to claim an additional state credit of up to $6,000 when they buy an EV. Together, these incentives significantly reduce the cost of buying an electric vehicle – more than 40 percent in some cases. The end of the year is the best time to take advantage of these credits, as buyers are able to claim them quickly, getting the clearest picture of their anticipated liability. 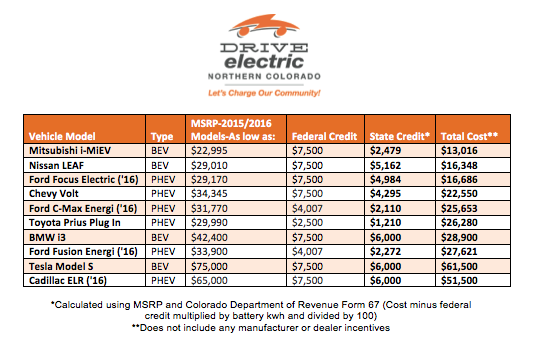 Drive Electric Northern Colorado has created a handy chart to give you a quick look at each vehicle, its MSRP, and the estimated savings from tax credits, which you can view below or at DriveElectricNoCo.Org/Tax-Credits. The prices listed below do not yet include the great deals from local dealerships, which you can find by clicking here. When you combine these powerful incentives with the other cost savings of driving electric (about $18 for EV charging every month compared to $125 for gas), it just makes sense to plug-in and save. For more helpful information about EV tax credits, as well as the forms needed to apply for the credits, visit DriveElectricNoCo.Org/Tax-Credits. How do I apply for and claim the tax credit? Colorado State Tax Credit: Colorado residents can apply for the state tax credit for either a vehicle purchase or a lease. Furthermore, the credit may apply to a used vehicle, as long as the previous owner did not claim the credit first. Some dealerships are offering used vehicles from out-of-state, which are eligible for up to $6,000. Those interested in applying for this credit should download the “Income 67” form, which outlines the process for claiming the credit, at www.colorado.gov. Federal Tax Credit: Electric vehicle purchasers can claim the tax credit by downloading and submitting Form 8936 from www.irs.gov. It is important to note that the purchaser must have enough taxable income to claim the entire $7,500 credit. The credit does not carry over to the following year, so if someone is only eligible for a portion of the credit, they will not receive the remaining amount next time they file their taxes. The federal credit is only available for original use—used vehicles are ineligible. In some cases, the dealership may be willing to claim the tax credit itself. In this case, the vehicle will sell for the original manufacturer-suggested retail price (MSRP), less $7,500. Another much more common option is to lease the vehicle, in which case the tax credit is typically factored into a lower cost monthly payment. There is a wealth of information about both federal and state tax credits available online. Be sure to inform yourself before purchasing an electric vehicle. Visit DriveElectricNoCo.org/Tax-Credits for more information.